Level 5: Lessons 1-25. Get the necessary grammar and phrases to speak Upper Beginner Portuguese naturally. Learn and speak over 700+ Portuguese phrases with this jam-packed iBook. Perfect for Beginners and Travelers alike! Level 8: Lessons 1-25. Learn Upper Intermediate Portuguese with these fun, effective lessons! Level 3: Lessons 1-25. 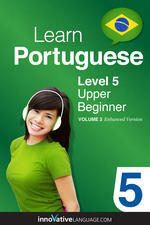 Lower Beginner Portuguese lessons get you speaking Portuguese with fun and easy lessons. Level 7: Lessons 1-25. Phrases, conversation, and grammar lessons for the Intermediate Portuguese student. Friendly start to the Portuguese language made just for kids. Learn 274 practical words through colorful scenarios. Friendly start to Portuguese made just for kids. Learn 274 practical words through colorful scenarios.